Such a move appears to be unprecedented, reversing a long-standing position taken by the federal government that it should not pay to outfit schools with weapons. And it would also undermine efforts by Congress to restrict the use of federal funding on guns. Such a move appears to be unprecedented, reversing a long-standing position taken by the federal government that it should not pay to outfit schools with weapons. And it would also undermine efforts by Congress to restrict the use of federal funding on guns. As recently as March, Congress passed a school safety bill that allocated $50 million a year to local school districts but expressly prohibited the use of the money for firearms. Department officials acknowledged that should the Education Department carry out the proposal, it would appear to be the first time that a federal agency had authorized the purchase of weapons without a congressional mandate, according to people familiar with the discussions. And while no such restrictions exist in the federal education law, it could undermine the grant program’s adoption of “drug and violence prevention,” which defines a safe school environment as free of weapons. In its research, the Education Department has determined that the gun purchases could fall under improving school conditions, people familiar with the department’s thinking said. Under the current guidelines for that part of the grant, the department encourages schools to increase access to mental health counseling, establish dropout-prevention programs, reduce suspensions and expulsions and improve re-entry programs for students transitioning from the juvenile justice system. But the department began exploring whether to expand the use of the support grants after the school shootings in Parkland, Florida, and Santa Fe, Texas, prompted states to inquire about alternatives. Department officials were considering whether to issue guidance on the funding before the start of the new school year but have been weighing the political and legal ramifications, according to people familiar with the discussions. In weighing the proposal, the Education Department has also taken into account that school shootings were not a consideration when Congress passed the Every Student Succeeds Act in 2015, according to people familiar with the discussions. Three of the remaining architects of the law — Rep. Robert Scott, D-Va, and Sens. Lamar Alexander, R-Tenn., and Patty Murray, D-Wash. — have all opposed the idea of arming teachers. 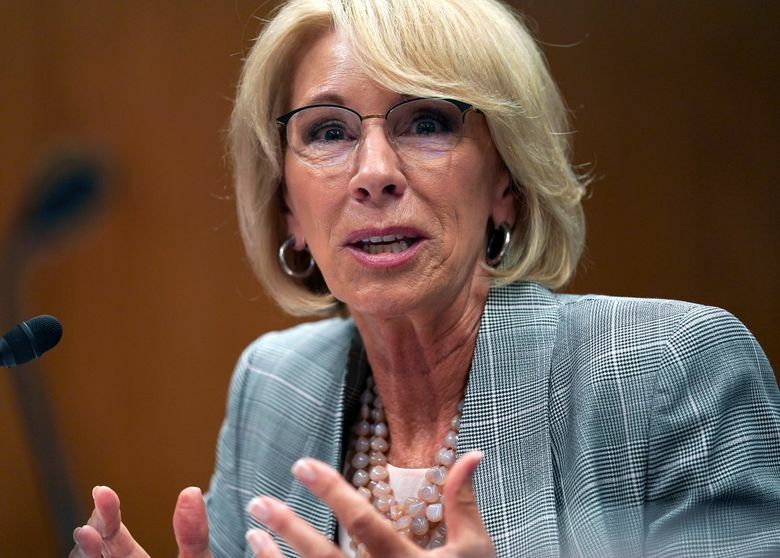 After the Parkland shooting, the Trump administration convened a federal commission on school safety, led by DeVos, to examine topics like mental and behavioral health resources, building security and the role of law enforcement in schools. In June, DeVos said the commission would not consider the role of guns in school shootings, but she later indicated that the panel would look narrowly at specific issues, including age limits for firearm purchases. Last month, DeVos’ assistant secretary for the office of elementary and secondary education, Jason Botel, reiterated that point in a congressional hearing. That prompted Rep. Donald Payne, D-N.J., to question the Education Department. In a letter to Botel, he asked if the department was planning to arm teachers.